Embroidery thread comes in different lengths, types and brands. Our Brother Thread is on 300 Metre spools and made from high quality polyester. Floriani Thread is available in over 300 shades on 1000 Metre spools and is made from high sheen polyester, we also stock Floriani's 5,000 Metre spools in certain colours and Floriani Variegated threads. The Maderia thread range we stock is the 40 weight Rayon on industrial 1000 metre open-ended cops. If you're new to embroidery or are just starting out building your thread collection, the Boxes of Brother thread are a good place to start. 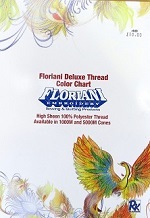 Click on the image to download a pdf of the Floriani Thread Chart. Please remember that PC screens will not accurately show true thread colours and should be used as a guide.